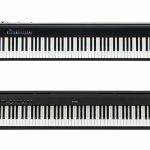 For people who are interested in music, we are sure you are already familiar with Casio since they are a trusted brand for electric piano with a good amount of experience in their sleeve. 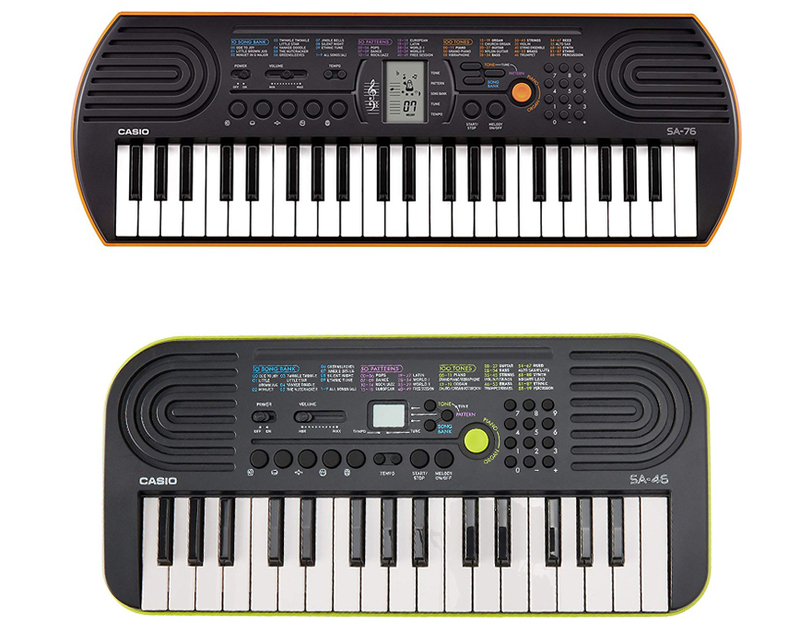 Two of their popular mini digital pianos are Casio SA 76 vs SA 46 which is very similar to each other either with the layout or the features inside. If you are confused about which to choose for your children or wondering about their difference, go check our article below. 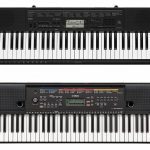 Casio has been making many great and dependable keyboards for so many years and just like their full sized ones, the compact, mini-sized digital pianos are also being loved by many of its users. 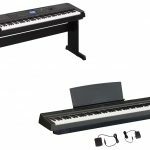 Some people may not prefer a piano at this size because they want to have the same experience like playing the classic pianos for example, but this size is also offer some other benefit that can’t be fulfilled especially for children. 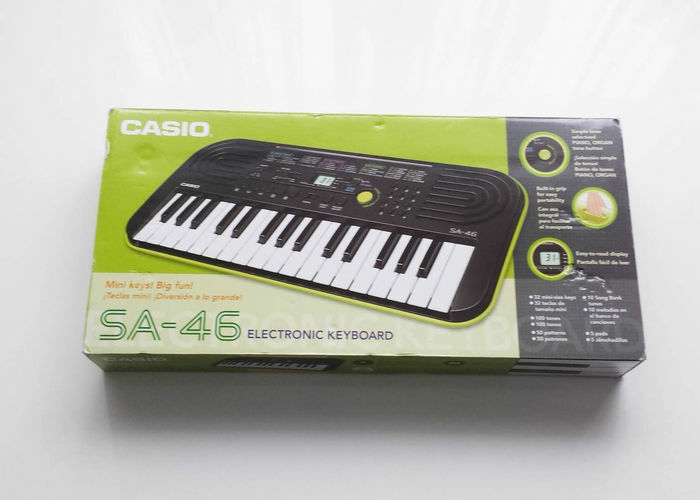 Casio SA 76 is a good product for either beginner or younger players thanks to the features inside. When looking at Casio SA 76, the first thing that will come in your mind is probably the size, because yes it is very compact; in fact it only has 44 keys, so the size is about half of your regular 88-keys. 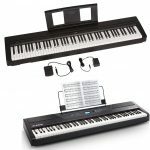 Just like you have expected, this piano is marketed towards young player or beginner who just start their learning journey, so they won’t get confused with a wider range of keys and allow them to focus on where they need to place their hands. Despite having a small size, Casio SA 76 is packed with a good amount of features especially for beginners or new learners. Inside the digital piano, there are 100 tones listed which is quite the amount even when compared to regular digital pianos. Among this listed sounds, the grand piano is the most dependable ones because it give a good sound backed up with the company’s reputation of building good musical machines. However, being a young beginner instrument, it is not supported by any of their reputable tone generation technologies. If the lowest polyphony you ever encounter is 32 which is usually found in many beginner pianos, this one comes with an even lower notes which is actually a concern if it is supposed to be played by older player. However, since the unit is marketed for children, it is still understandable unless they want to play complex notes like Beethoven, then there will be a problem with dropping notes. Inside the piano, there are 50 different rhythms which can be used to develop a sense of rhythm and composition together with 5 different drum pads. Additionally, there are 10 practice tunes to help new players to learn how the piano should be played as well as to play along with. This practice tunes is focusing on helping players to get a sense how music is played. The Melody Cut Rehearsal system is useful to help children learning to play with the right hand. 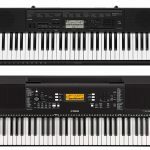 Since people who look at this type of digital piano is mostly parents who are looking for a new pianos to help their children starting their piano lesson or want them to learn how to play the instrument, you may want to start from the very basic and if you think the SA 76 is a bit expensive or you just want to find an even easier piano to play, the SA 46 seems like a good option. These two are very similar yet also different in some parts. 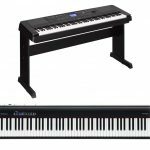 Read also: Alesis Recital vs Yamaha P45 here. When looking at Casio SA 46, we can see that this one is even smaller than the older brother. It is because the piano is only sporting 32-keys on its layout which is probably only exist in children instruments like this one. The appearance is also a bit different because unlike the previous unit with its round sides, this piano is sporting a straight sides with a round corner, so you don’t have to worry about them accidentally bumping and hurting their body parts on the piano. The build quality is not amazing but it is sturdy enough and clearly well-built. 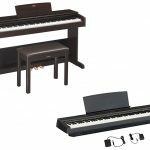 With a piano at this size, it is hard to ask for more because the unit itself is already compact enough and supporting a set of useful features that will be a great help to develop your children skill and learn how to play the instruments. All the features you can find in the more expensive SA 76 are all in here except for the keys because it is clearly less. The control panel is also simple and easy to use, so even young players can get used to the piano quickly. 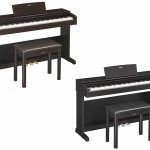 As it has been mentioned earlier, SA 46 has all the features from the more expensive piano. 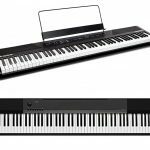 This one is coming with the same 100 tones which is superior to many digital pianos even those marketed at older players. The sound is decent even though the company didn’t use any of their more modern technologies that you can find in their higher-end models, but since it is marketed for young players, this shouldn’t be a concerning problem here. In addition to the tones, this piano is only backed up by 8-notes polyphony, so when you try playing more complex notes, there will surely be a dropping notes. Rhythm is counting at 50 options which is good to help your children develop their sense of rhythm and composition when playing. Its 10 practice tunes is also great to be played and to play along with. 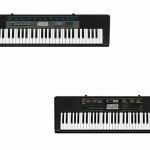 Now, let’s compare Casio SA 76 with SA 46. As you may already know, the prominent difference between them is the fact that SA 46 is only coming with 32 keys while the other is with 44 keys. Besides that, all the features inside are all the same. All in all, the decision is all yours to make. In our opinion, both of them are a good options and similarly helpful for your children. However, if you prefer them to quickly get used to full size when their skill is developed, it is good to pick Casio SA 76 with more keys.